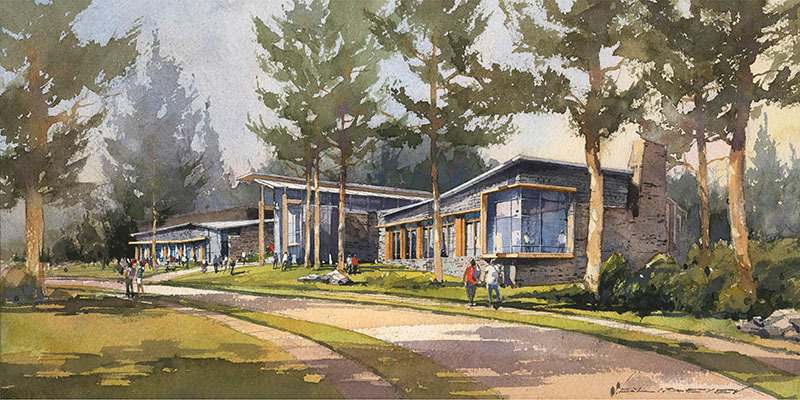 Bronxville, NY Sarah Lawrence College has been awarded a $2 million grant from New York State’s Higher Education Capital Matching Grant Program (HECap) that will support construction of the liberal arts college’s Barbara Walters Campus Center. Currently under construction, the $35 million Barbara Walters Campus Center is a donor-funded project driven by a lead gift of $15 million from one of the college’s most notable alumni, renowned journalist Barbara Walters. Upon its opening in 2019, the center will boast ample, flexible spaces for gathering and connection, and will serve as a magnet for intellectual, cultural, and social life on Sarah Lawrence’s 40-acre campus. A thoughtfully-designed building with a focus on sustainability and environmental responsibility, the center will also be a “front door” to the college, welcoming neighbors from the community to share cultural experiences. Founded in 1926, Sarah Lawrence is a coeducational liberal arts college that consistently ranks among the leading liberal arts colleges in the country. Sarah Lawrence is known for its pioneering approach to education, rich history of impassioned intellectual and civic engagement, and vibrant, successful alumni. In close proximity to the unparalleled offerings of New York City, the historic campus is home to an intellectually curious and diverse community.